Electronic gadgets and quality coffee may sound like an unusual partnership, but this café works surprisingly well. Co-owner Jaroslav Tuček describes the aesthetic as, “open, clean and simple” with modern furniture and technology-themed designs adding character to the pale walls. The floor plan provides plenty of space for stroller-wielding moms to coexist peacefully alongside the mobile workers and students utilizing outlets and password-free wi-fi. 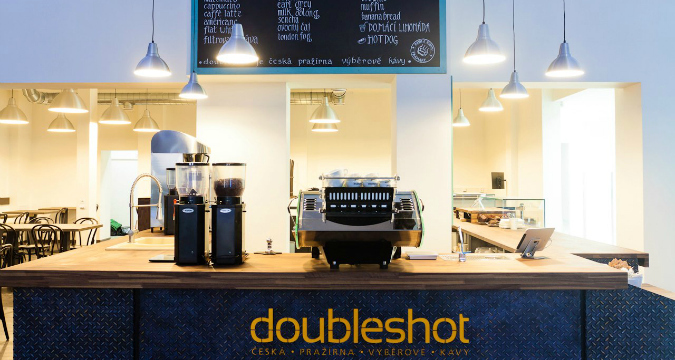 This idea was inspired by a member of Alza’s management team, who was also a regular customer at Tuček and friends’ Muj Šálek Kávy cafe in Karlin. When Alza decided to add a café near the space where customers pick up their purchases, he made sure that his favorite baristas were among the bidders. The entire bar was built in just fourteen days in December 2012 in order to be ready for Christmas shoppers. The staff is friendly and knowledgeable, maintaining their passion for coffee amidst high-volume demand. “The customers aren’t always informed about quality coffee,” barista Veronika Urbanova explained. “They just want something big and cheap, but we still care about the quality.” The staff is happy to explain the background of the beans and recommend a drink – my friend was especially excited to find London Fog (50 CZK) – Earl Gray tea, vanilla syrup and warm milk – on the menu, while my latte (55 CZK) was as beautiful as it was delicious, with a delicate leaf drawn in the foam. Handmade brownies (40 CZK), macarons (15 CZK) and sandwiches (45-60 CZK) are also available. Verdict: High-quality coffee in a comfortable workspace. The concept shop exudes tranquility, with fresh flowers from a local farmer’s market topping the natural wood tables and folding chairs. Tons of natural light streams through the wraparound windows bordering the balcony, even on a cloudy day. The bar itself is fashioned out an Airstream trailer, and vintage touches such an old sewing machine and CD player give the room a homey feel. Vegan visitors will rejoice at the option of soy, rice, or almond milk available. The coffee, along with everything in the shop, is made with care (latte, 55 CZK) – and this trend extends to the sweets. The designer’s mother makes homemade pastries from every three days, so you never know what you’re going to get. My Jablká v Župane (Apple in a Bathrobe) was deliciously fresh. The alcoholic offerings are sourced locally, including microbrewery Matouška and Kraus sekt. Verdict: A quiet oasis for the environmentally conscious coffee drinker. 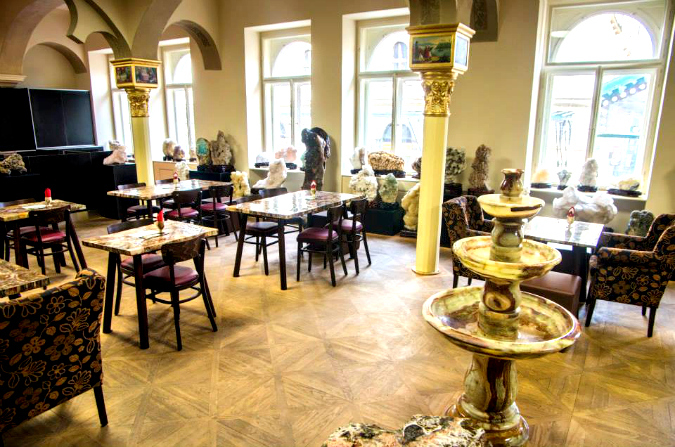 Coffee and books have a longstanding relationship – The Globe or Café Knihkupectvi Fra in Prague being among the most well-known. 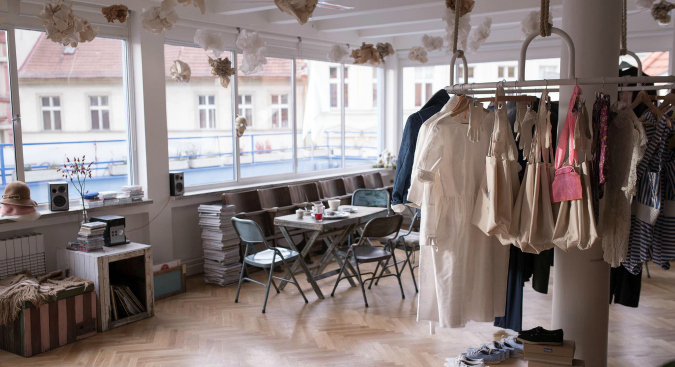 One of the newest, a family-owned, secondhand bookshop and café in the shadow of the Prague Castle, provides a whimsical escape in a fairly touristy area. The name translates to “By the Wise Lantern”, but evokes the color blue (modrý) of the light adorning their entrance. From its plush furniture to the softly scented candles permeating the refreshingly soundtrack-free air, U Moudrych Luceren exudes quiet comfort. Wifi is available only in the bookstore section, not the café, leaving it free of clacking keyboards. This is a sanctuary for book-lovers, not digital entrepreneurs. Opened in March 2014, they may lack Starbucks-style efficiency, but each drink is prepared with a friendly smile. The velvety foam on my latte (49 CZK) was worth the wait. The selection of snacks is limited to sweet or savory plastic-wrapped bars available at any supermarket, but the high-quality hospitality and serene environment overshadow any shortcomings. Verdict: Quality coffee in the comfort your grandmother’s living room. This newcomer to the café scene is designed to serve the patrons browsing the extensive selections of crystals and minerals for sale, but might be worth a visit on its own. The décor is reminiscent of a high-end hotel lobby with comfortable leather sofas, high-backed chairs and fossilized wood tables surrounded by precious stones and sculptures. The self-service bar is more functional than artistic – the cakes come lined with plastic that hints at maintaining long-term shelf life. My medovinik (49 CZK) bordered on dry, but was still enjoyable. The coffee is fairly affordable (latte, cappuccino, 45 CZK) and the password-protected wi-fi was reliable. Overall, the space sets a comfortable, relaxing scene that the locals should take advantage of while this tourist attraction remains undiscovered. Verdict: Comfortable seating, impressive atmosphere and decent coffee. Bajkazyl is a hipster haven that marries the alternative scene with sports enthusiasts. The interior is one part-bike repair shop, one part-dive bar, with wheels, spokes, and spare parts lining the walls and a bicycle hanging over the bar. Just off of Žižkov’s cycling trail and the Karlínského tunnel, the location provides a nice break in the middle of a long ride or walk home. The outdoor patio is lined with wooden benches and repurposed doors as tables, giving it a rustic charm, even if the gravel and uneven surfaces threaten the stability of a tall glass. Visitors can enjoy an afternoon of people watching from a perfect vantage point over a latte (48 CZK) on a sunny day. And if you’ve got work to do, the password-protected wifi even reaches the outdoor area. Verdict: A functional, alternative space with quality coffee. Where do you like to shop and snack? A city girl with an affinity for sunsets and shooting stars, Auburn has lived in Seattle, New York, New Zealand, Greece, Boston, Liberec and Prague. She is passionate about arts – from classical music to Harry Potter. She loves discovering cultural traditions or the latest in modern technology.